Best Large Diaper Bags: Which Should I Choose? Having a baby comes with many responsibilities, and as a parent, it will be your natural instinct to protect your child and to make sure you are always able to provide for his or her needs. Choosing the right diaper bag can be hard because you want to make sure it can fit everything your baby needs, and sometimes including yours too. So today, we will talk about the best large diaper bags out there. Most parents prefer to bring just one bag for convenience when going out. It should already fit all the baby stuff like clothes, diapers, milk, food, bottles, toys, cleaning items, and even your things such as your wallet, phone, and keys. Yes, it’s no secret that it can be hard to choose the right bag that will make your life as a parent easy. So, how do we choose the perfect bag? Let’s find out! On this post, we will compare the features, advantages, and disadvantages of the top three items out on the market today to help you choose the perfect diaper bag for you. This diaper bag is large enough to fit all the baby stuff that you need to bring. It can be used as a travel backpack for outings, shopping, and excursions. It has 16 pockets, and it looks classic and elegant. It is made of high-grade polyester. It has two main compartments, one front pocket, and two mesh side pockets. It measures 11.8 inches long, 7.1 inches wide, and 16.9 inches tall. It comes with a changing pad which measures 21.2 inches long and 13.4 inches wide. It has one pair of stroller straps. It has four insulated bottle holders. It has two waterproof pockets for wet items. It has one special pocket for the pacifier. Its fabric is water-resistant and is durable. It has padded pockets which can hold a 15-inch laptop. It comes with an easy-tote handle and padded shoulder straps. It is made of high-grade materials which make it durable and robust. Its fabric is water-resistant, and it is easy to wipe clean. It comes with a changing pad so you will not need to purchase that separately. It has one pair of stroller straps so you can easily attach it to your stroller. It has four insulated bottle holders so you can keep the temperature warm or cold for a longer time. It has two waterproof pockets so you can separate the wet items from the dry ones. It has a separate and special pocket for the pacifier, so it is easier to get. 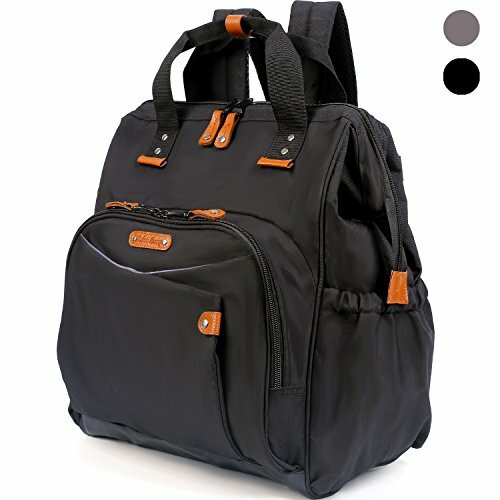 It has padded pockets which can hold a 15-inch laptop, so you will not need to bring a separate bag. It has an easy-tote handle and padded shoulder straps for your convenience. 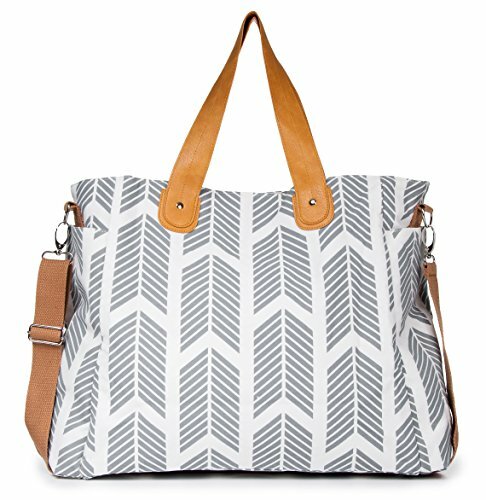 This large diaper tote bag has interior and exterior pockets so you can organize your stuff conveniently. It looks very fashionable, and you have plenty of colors to choose from. You can also use this bag for other purposes since its style does not only qualify as a diaper bag. It has six pockets with four interior and two exterior deep bottle pockets. It measures 19 x 16 x 6 inches. It can fit breast pump supplies and cloth diapers. It has a vegan leather top handle and an adjustable and removable cotton crossbody strap. It is made of durable and washable cotton material. It has four inside pockets and two exterior deep bottle pockets so you can organize your stuff conveniently. It can fit breast pump supplies and is an excellent choice for those using cloth diapers. You have two ways to carry the bag with since it has a vegan leather top handle and an adjustable and removable cotton crossbody strap. It is made of high-quality cotton which is durable and washable. It has a magnetic snap closure which makes it easy for you to access what you need. It does not have insulated pockets for your bottles. It does not come with changing pad. It does not have pockets for wet items. It is not structured, and it will not stand on its own. This bag is a wide-open large tote bag with stroller straps. It has a unique design, and it comes with a lot of pockets so that you can pack your stuff in a very organized manner. You also have enough space for bottles, clothes, diapers, and even include your things like your laptop, wallet, and keys. Its color is also designed to fit both moms and dads. It has eight interior pockets and eight exterior pockets including four insulated spaces. It is made of high-quality fabric which is waterproof. It has padded shoulder straps and handles. It has a durable leather bottom. It comes with two stroller straps. It comes with a padded changing mat. It has 16 pockets which allow you to organize your stuff conveniently and provide enough room for all your stuff. It is made of high-quality polyester fabric which is waterproof and durable. It comes with padded shoulder straps, hand straps, and stroller straps, so you have different ways to carry it. It has a padded back for your convenience when carrying the bag. It has four insulated bottle pockets so you can keep the temperature warm or cold for a longer time. It does not have separate pockets for wet items. After a thorough comparison of the top three diaper bags out on the market today, can we now choose from these best large diaper bags? 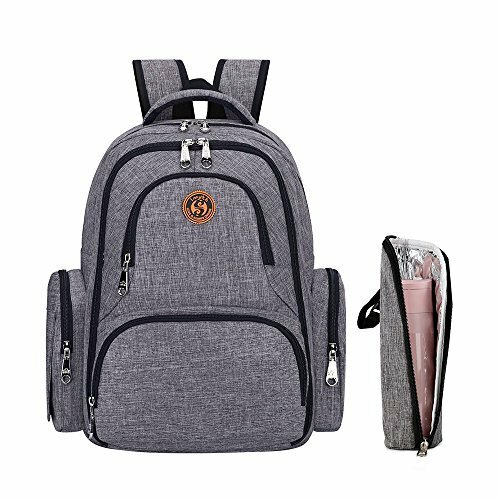 Our top pick is the Imyth Travel Diaper Bag since it has 16 pockets which will provide enough space for all of your needs for a very reasonable cost. However, if you need a smaller bag and if you prefer a tote bag, then the White Elm Arrows Weekender Bag is a good choice for you, but it does not have insulated pockets. The Baboo Bunny Diaper Bag Backpack, on the other hand, also has 16 pockets but is twice the price of the Imyth Bag. Overall, we can say that they are all awesome choices. All you need to consider now will be your needs so you can choose the perfect bag for you and your baby.